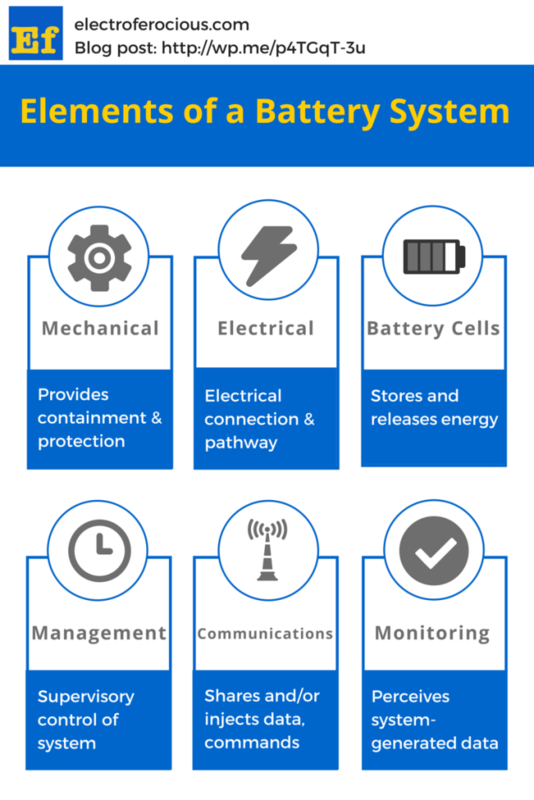 Establishing a common terminology and a few key concepts about battery systems will be useful to the ongoing discussions of performance, security, risk, and design. To facilitate that, I explain two diagrams showing the elements of a battery system and a simple battery system architecture. The mechanical layer of a battery system provides containment and protection for the battery cells and the surrounding environment. Examples include physically holding the cells in place, protection from humidity, and isolation or mitigation of the effects of shock and vibration. The electrical layer of a battery system connects the electrical components of the battery system together and is a pathway for the movement of charge within the battery system and to its terminals. Example components include the battery cells, electrical interconnects between the cells, and the battery terminals. We’re all familiar with battery cells. Think of your standard AA, AAA, or cell phone battery. When discussing battery systems, it is very easy to use the word “battery” to refer to an entire battery system, leading to confusion when one person says or writes”battery meaning battery system” and another person responds with “battery meaning battery cell”. This happens more often than you’d think! Another way to refer to battery cells is to use the term “cells”. The management layer provides supervisory control of all aspects of a battery system. This includes charge management, thermal management, safety, and performance management. The canonical example is the BMS or battery management system. The communications layer allows information about the state of the battery system to be shared internally and with the outside world. It also allows control inputs to be injected into the battery system. Similar to the monitoring layer, the communications layer is somewhat redundant when a well-designed BMS is in place. Unlike the monitoring layer, however, the communications layer is an optional element, usually included as part of larger application requirements. One example is the export of data about the battery system state of charge, charging, and load profile to a centralized monitoring system overseeing multiple battery system deployments. The monitoring layer is responsible for perceiving the state of the battery system and its components. This function is typically integrated with the BMS, however some systems use a monitoring system and include a rudimentary BMS that toggles battery system behavior. Examples include thermal and voltage monitoring using sensors. 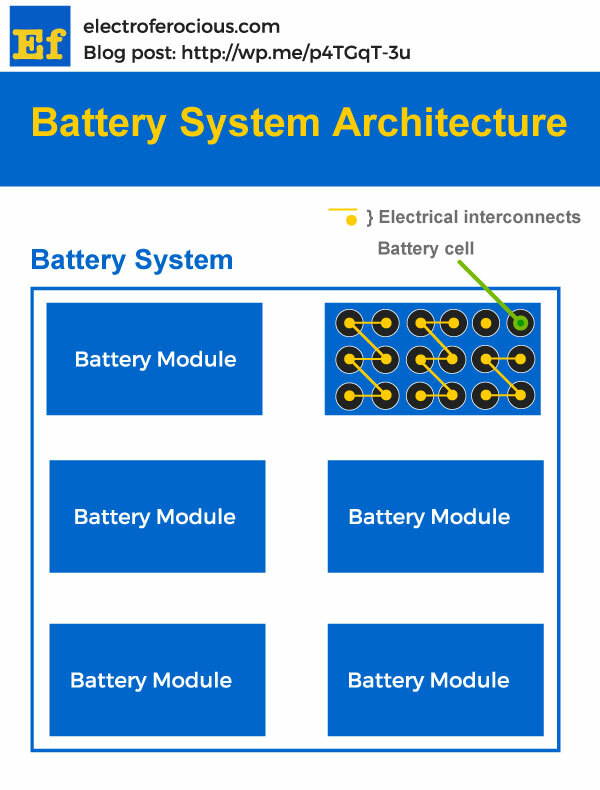 The simplified battery system architecture below highlights the concept of modular design in grid-scale battery systems. Not shown are components which are included (or not) in a number of different configurations such as: blowers or cooling pipes for an actively cooled battery system; battery management system; communications and/or monitoring systems. This brief introduction sets the stage for more in depth coverage of these topics and their impacts in the project finance world. If you’d like me to address a particular subject sooner rather than later, let me know in the comments.